Out With The Map: Time For A Recipe! Today was a busy day for me; running errands, exercising, putting the apartment together, etc. But despite being busy and worn out after a long weekend, I decided that I needed to make dinner tonight. The last time I actually cooked was around Wednesday last week...I think. Today's recipe is from AllRecipes.com and is sooooo good! 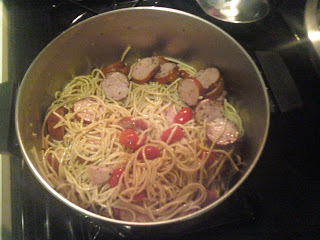 I made Smoked Sausage with Pasta and it was delicious. Very flavorful, yet suitable for all your varying taste buds. 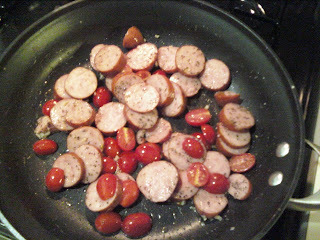 Sauteing the tomatoes and smoked sausage. It smells so good! Definitely check out the website linked above for some better pictures. These are just rough pics I took with my crap phone.